That’s a good question? Many common English expressions come from a time when horses were a part of everyday life ‘taking up the reins’, ‘getting back in the saddle, shutting the stable door after the horse has bolted’ and referring to nefarious business practices as ‘horse trading’ but are we really ready to invite horses into our Boardrooms? According to international management consultant and horse owner, Ineke Pitts, we should definitely give the idea some serious consideration. “Horses”, she explains, “have an almost unique ability to act as a mirror to human behavior. Unlike dogs or cats that are hunters and naturally cunning, a horse is completely authentic. It doesn’t understand nuance and has no ability to lie or pretend. “Basically a horse will let us know when we are bring true or being false […] This provides us with deep, pure, ruthlessly honest feedback that is priceless in its value in helping us clarify our purpose in life, our unlimited power and intentions”. Ineke spent time with Paul when he visited Sri Lanka in 2017 and studied under him in the UK to become a HAT Coach for Sri Lanka. As the owner of several retired racehorses, Ineke finds a job for them that creates life-changing impact on people in just 4 hours. Her best coach is Merlin an 11-year-old bay gelding and the tallest horse in her stables. Merlin was a class one racehorse, he came third in the Bangalore Derby and arrived in Sri Lanka ready to compete in the iconic Nuwara Eliya Governor’s Cup race. Luckily for him, Ineke fell in love with him and brought him to live at her stables. Merlin has arrhythmia which means he cannot be safely ridden and would most certainly have perished on the track. 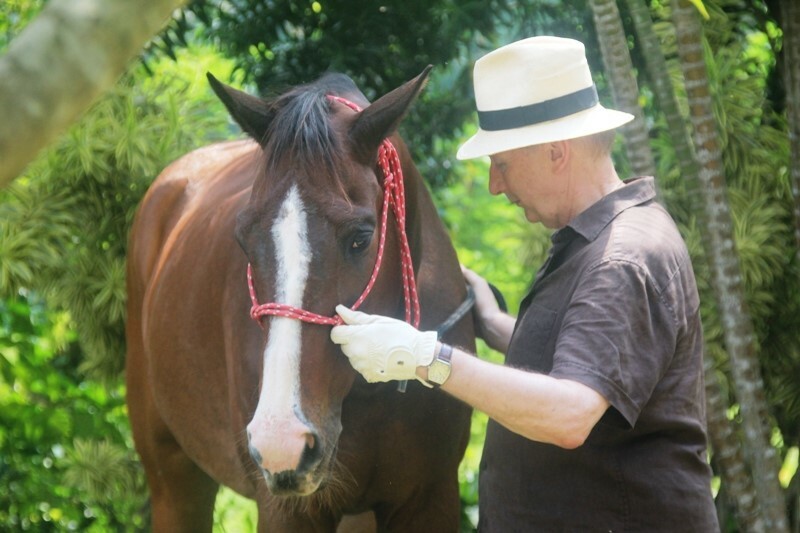 I retired him when I found out, and he lives out his life as a therapy horse at Ceylon Riding Club. “I know he will not live to an old age but I want him to have a happy and productive life” she said. Merlin is an alpha male. Through HAT Coaching, Merlin has so far helped around sixty managers from Sri Lanka and the region to be more aware of themselves and the energy they put out to others they work with. As a result they are able to be more authentic in their dealings with others and overcome challenges that have confounded them for their entire lives; they are no longer victim to the super ego. There have been survivors of domestic violence and abuse who, through Merlin, have learned to face up to their aggressors and put terrible memories behind them for the first time. They have all found their ‘real’ selves and the power that they hold by virtue of being a human being, born into this world, perfect, vulnerable and all powerful. Ineke Pitts is one of the most experienced facilitators in the region with 21 years working with corporates in Sri Lanka and the last ten years as a an OD and Leadership development guru supporting leaders in places such as Afghanistan and Bangladesh, where leadership can be a matter of survival. As Director of MDF Asia, based in Sri Lanka, Ineke and her team have developed approaches to leadership development that have been tested in the most extreme situations; such as remote locations in rural Afghanistan. This is often referred to as VUCA, where the context is volatile, uncertain, complex and ambiguous. We noticed that this is not so different from business as usual in the RMG sector in Sri Lanka, for example. VUCA is a context that we all need to prepare for. Leading in VUCA times is a massive challenge. Ineke and her team at MDF and the Ceylon Riding Club are looking to present these ideas to the HR community in Sri Lanka during the early part of 2019.